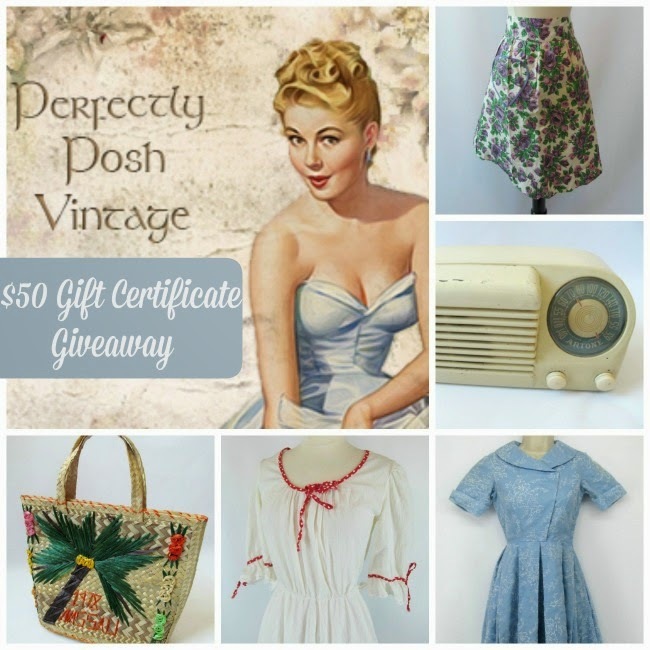 Today I have a lovely giveaway from my sponsor, Perfectly Posh Vintage. The prize- $50 gift certificate to Perfectly Posh Vintage, may be used on anything in the shop, including shipping. I want the radio !!!! Oh, I'm in love with the "Vintage Mid Century Pair of Brass Bird and Tree Candle Stick Holders." Darling! Vintage 1960s Green and Brown Leather Swiss Ammo Bag Satchel. I have been dreaming of that bag. I have my eye on the Vintage 1960s Green and Brown Leather Swiss Ammo Bag Satchel! Love the turquoise screw back lotus earrings!!! Can't choose, so many beautiful things! There are too many beautiful things to choose from. I especially love the 1950's Van Raalte Coral Peignoir Lingerie Nightgown. I love the Vintage Wood German Christmas Carousel Pyramid. They are so fun to watch them spin. Oh my goodness. The long gray military coat, and the olive green Czech military jacket. I can feel my paychecks slipping away ! basically nearly everything! I have to say the 70's does 30's gown is really stunning! Brass USA charm bracelet. Though the punch tab isn't working for me. Does this count as an entry? I would have to go for the "Red and White Partial Peplum Strapless Formal Gown "... how dramatic! I love the German granny square blanket!!! The colors would look great in my living room! 1950's Van Raalte Coral Peignoir Lingerie Nightgown; hand knit white cardigan, or the handmade yellow top on the first page! Love them all! It's hard to choose just one, but I love the Vintage Weiss Rhinestone Flapper Fringe set. So lovely. Oh, the green floral shift dress! It's so hard to choose one thing-- I am coveting that yellow radio as well. The 1950s pink floral full apron! So adorable! Oh, it's got to be the clear rhinestone 50s choker~! I am in love with the Vintage "1950s Gellywog of Florida Decoupage Fall Leaf Box Handbag" because we are in the midst of Autumn (Fall) here and it would be the ultimate bag to go with all my outfits...I even have a golden leaf brooch/earring combo. I adore the '1950's Van Raalte Coral Peignoir Lingerie Nightgown', the colour is so beautiful and warm. I've been dreaming of a two-piece sleep set like this for years! Loving all the items...but wanting the Vintage 1960s Yellow Vegan Naturalizer Faux Snakeskin Kelly Handbag!! Id love to have the Vintage 1950s 1960s Baby Blue Flowing Nightgown!!! I really like the jewel tone wool plaid skirt. It would be so nice for this fall after the baby is born and hopefully I have some sort of waist again, lol. I love the extra small 1940s light blue dress! It's one of my favorite colors, AND it's even my size!!! Oh, the pale yellow ivory radio! The Ivory Radio! It's beautiful!! I just love the Vintage 1960s Gold Tone Perfume Locket With Black Scarab Cabochon So pretty and mysterious. I'm smitten with your Black and White Swirl Plus Size Dress. Thank you for remembering those of us with "generous" proportions! i love the Adorable Vintage Hand Knitted Crocheted White Scallop Bombshell Cardigan and the 80s black zipper suit!